I was feeling super crafty over the weekend, so after I painted my nails, I made this t-shirt. I had seen this cut-out tee many places & every time I would think, "I could totally make that!" 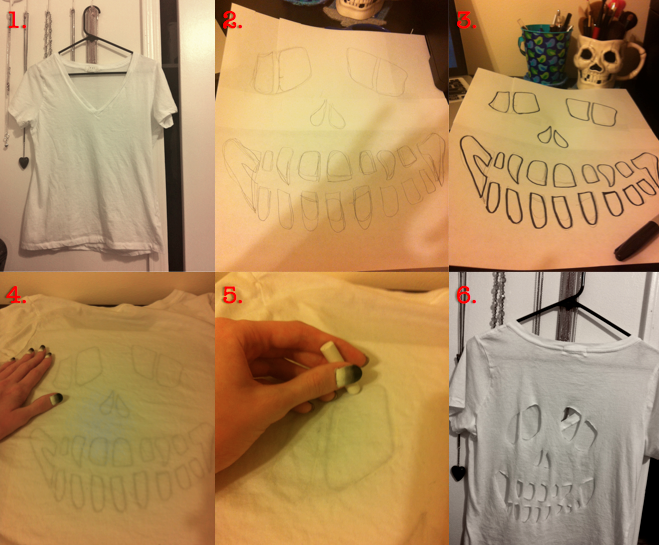 So here's how to make your own Cut-Out Skull tee! Pick out your t-shirt. You can use any colour, style, or size. I chose a v-neck white tee in a loose fit from Forever 21 that cost less than $5. Measure out the size of the back. I just compared it to a size of 8x11 paper, taping several pieces together to get the size I wanted. Next, I drew a skull based on Google images as well as my skull mug that holds my make-up brushes! After a rough pencil sketch, go over the lines with a Sharpie. Place your template under your t-shirt. You should be able to see your Sharpie lines through the fabric. If you are using a darker shirt, try taping your shirt it to a window so the light will shine through. Go over the lines of your template using chalk or a washable marker. Cut out the shapes. This is the most time consuming of the steps. I tried to leave more space between cuts so that my shirt will last longer without ripping. Ta-da! Now you have a Cut-Out Skull shirt for under $5 (free if you use an old shirt!) This shirt would look great over a bikini, bandeau, or brightly-coloured tank. Cut-out/open backed items are great for summer; it gives some much needed ventilation for those hot days!